I've had these around for awhile, time to put them together. As usual with Tamiya near perfect fit, but this time with a slight divot. The first kit I bought was when they first came out, and Tamiya had not realized that the museum example was an F.1 that had F.3 wings grafted on that had spoilers, unlike the F.1 wings, due to damage to the original wings. 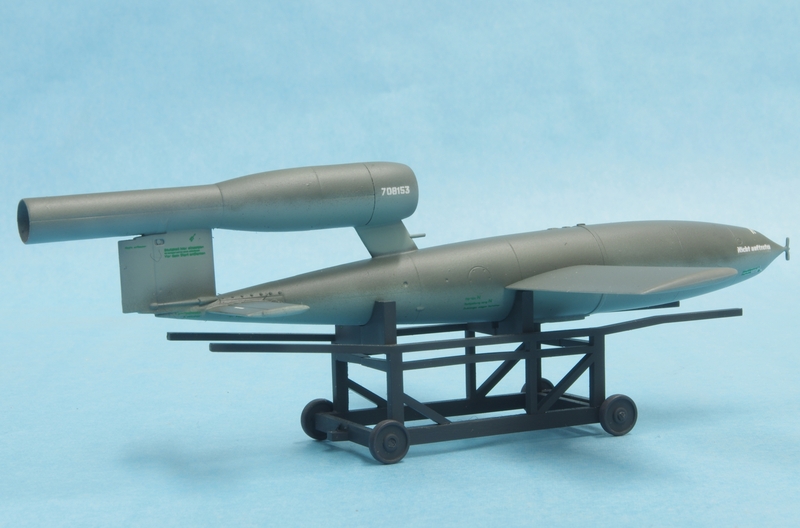 Tamiya reissued the kit as an F.1 with corrected wings and also included a V-1, which the F.1's had successfully shot down 14. 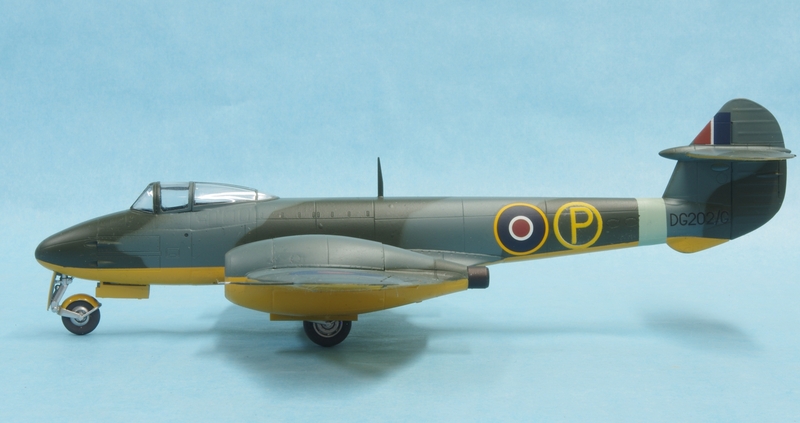 They later released the F.3 kit as well. I had previously gotten a Squadron vacform canopy to help convert the first F.1 to an F.3, but Monday I called Tamiya and was able to buy the necessary sprues from the F.3 kit so I can use nice Tamiya parts with no cutting and fitting, No decals but that's not much of a problem as the same squadron used F.1's and F.3's. As I read it as soon as the F.3's were available the F.1's were parked. I plan to do the F.1 as the prototype with trainer yellow lowers. The engines painted up real pretty I thought, although they are a general representation of the Welland. Good enough for me. 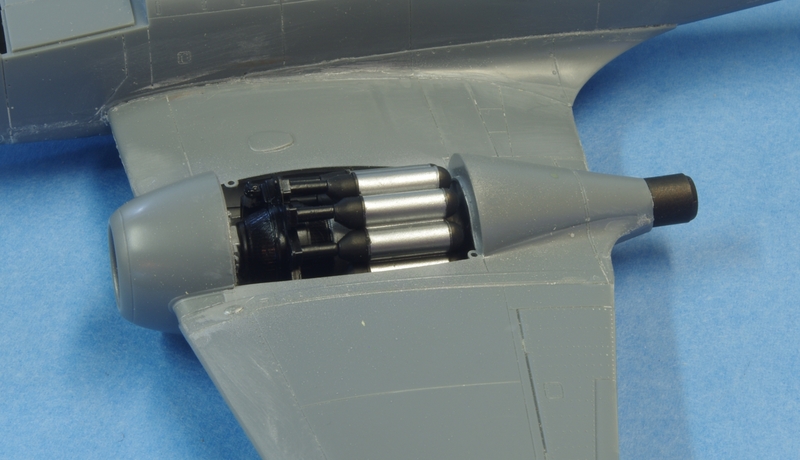 It will be possible to have the engine covers removable, they press in place. In fact I had to shave a few thousands off of one of them to get it to fit. 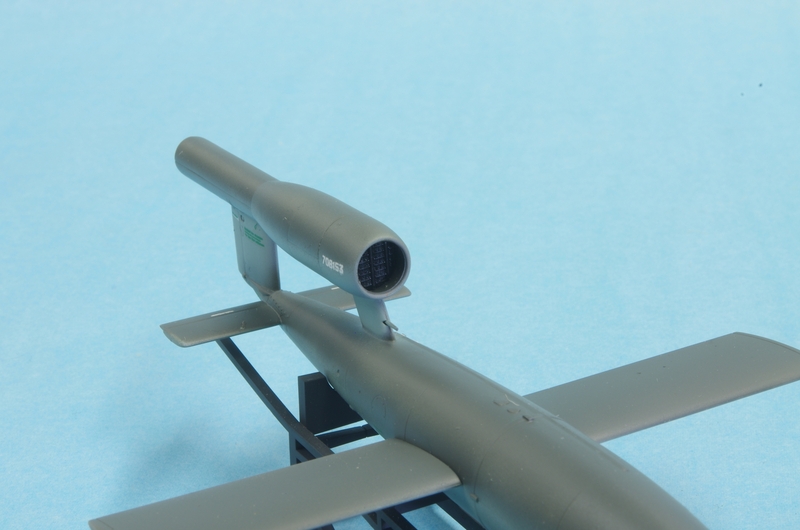 Both kits come with long and short tailpipes, the F.3 was Derwent powered and had a shorter tailpipe. 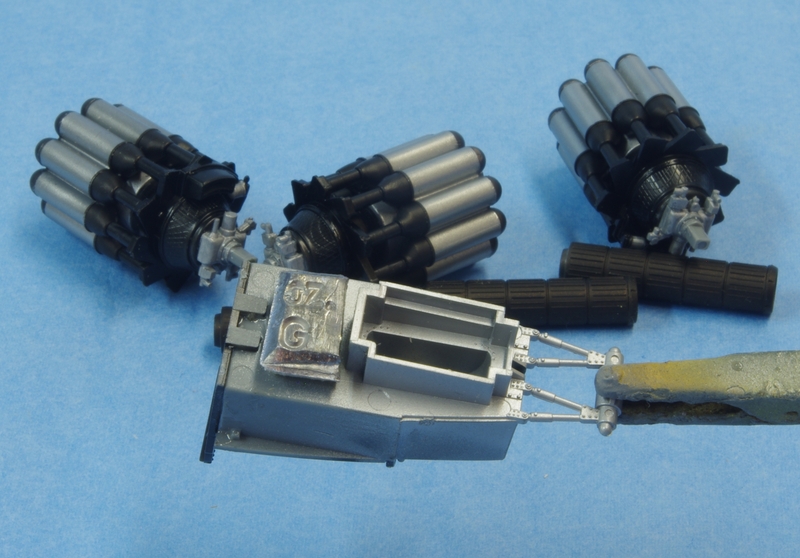 There will be no point in posing the F.3 with the cowls open as the Derwent has a very different burner can arrangement. 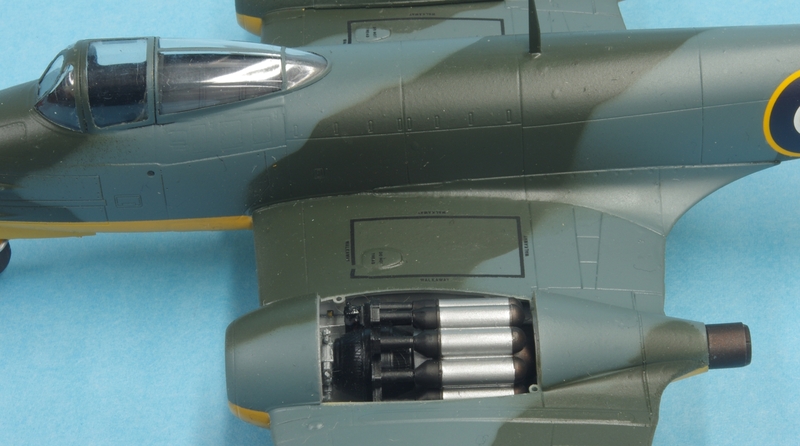 The first 15 or so F.3's still had Wellands but I want to build a later version with the tailpipe difference. 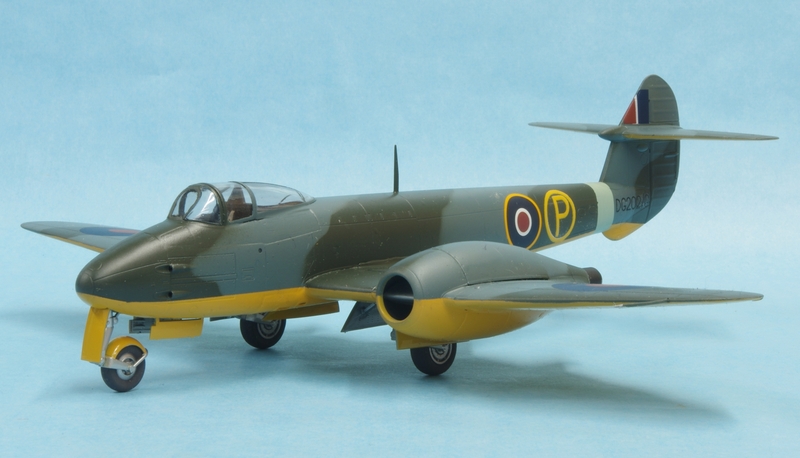 Tamiya did not model the Derwent in their F.3 kit. 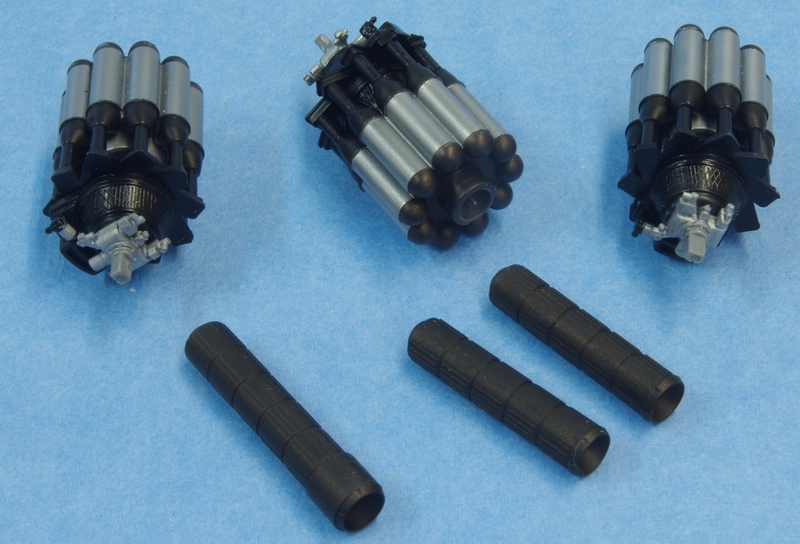 They did, however, include both tailpipe variations in all the kits. The cockpit is fairly basic and it's also very black, other than the seat and seat belts. I tried to highlight stuff a little but it just isn't going to be visible other than the seat, stick and panel. 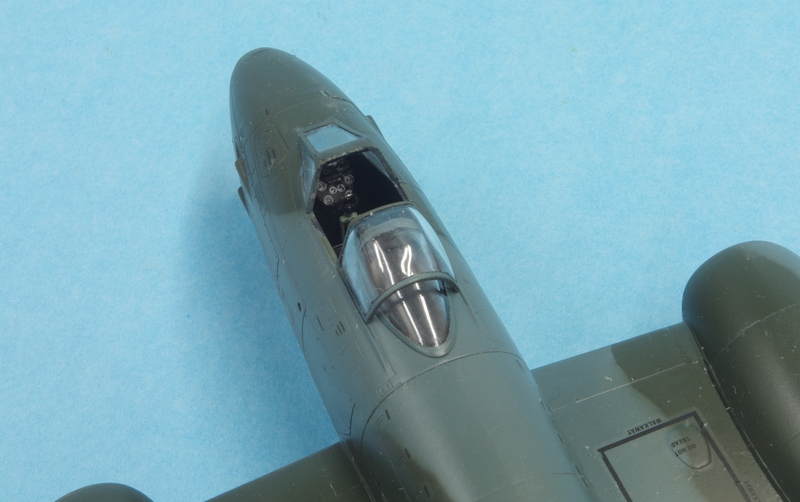 I may have to add some detail to the back of the panel on the F.3 because with the different windshield it will be very visible. Eduard Sutton harnesses were put in, using the glue that is cured with UV light. It really made it easier to do, and that was helpful because in this case it seemed better to install the belts after the seat was installed in the tub. I had bought some on the web, but then I found it was available at Walgreens and I bought some more there today. The glue is sticky enough to hold the pe in place until it is arranged right, and then you shine the light on it and it cures right up. If you have excess glue you can wipe it off before you set it with the light, but it will bring a little paint with it, both acrylic and enamels so there may be a little touch up. Sooo much less hair raising for me than CA because of my old, big, and shaky fingers. 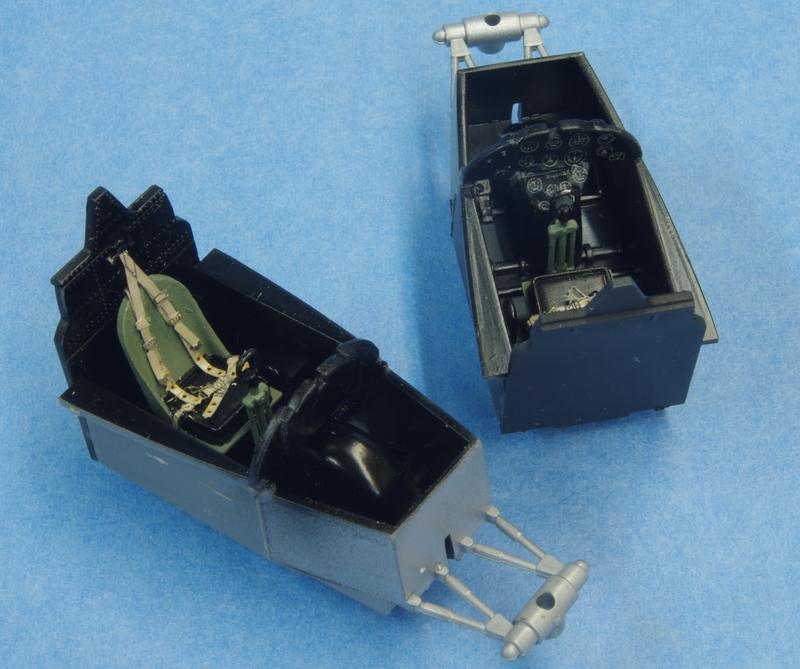 In the last photo you can see that I added a little more weight under the seat using a stick on weight for R/C models, I've read that the model call still fall on its tail if bumped with only the weight that comes in the kit. Nice to see this, John. Do you still have that Whittle jet I traded to you? Sure do, Bill, been thinking about serving it up pretty soon. Should just "squirt" out of the box, right? That's a great start. This is the first time I've seen this glue system being used in a WIP. I've heard of it but never took the time out to research it. Great job, I'll be following. I use that laser bond glue now for gluing in windows in bombers and airliners. If those pop in after gluing the fuselage together, you have a problem! Before, I used either the windows cement (like white glue) or epoxy. 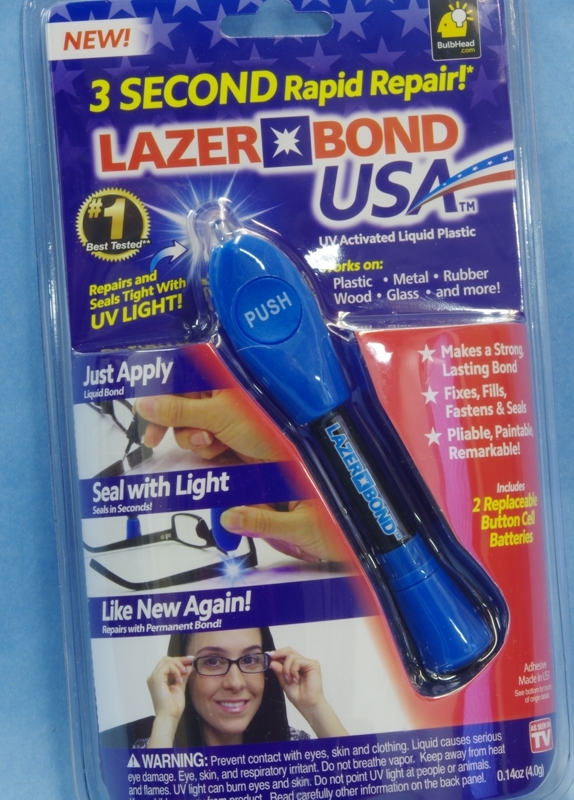 I find the laser bond does not fog like CA, is much stronger than the white glue-like stuff, and is more reliable than epoxy. Great start on an iconic aircraft. I think I'll stop by Warlmart today on my way back from the dentist. Looks like, for certain applications, that laser bond material will come in handy. 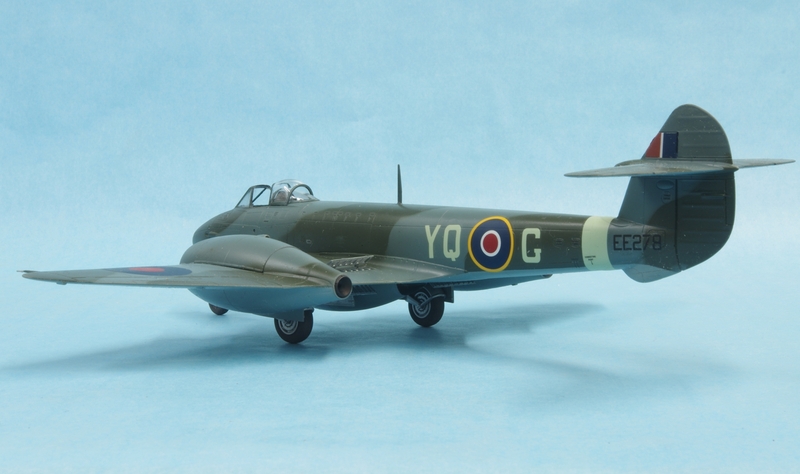 Here's an update on the Meteor F.1. 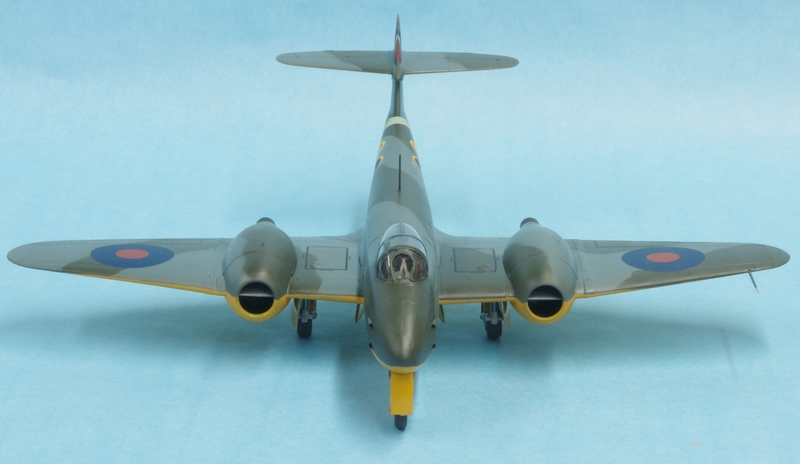 I have decided to do it as the prototype, the F.3 will be a Derwent 4 powered in service type. Just some pictures, no dramas to report here. It will have the trainer yellow lowers, the gear looks pretty sporty. That yellow looks gorgeous. One of the hardest colors to deal with! Toshi, british trainer yellow is one of the easier yellows to use, it is a bit orange and seems to cover better than a pure yellow. It still needs a white undercoat. Gloss yellow is the most difficult, I do it just like I do a gloss white, use flat yellow with a thin last coat of gloss yellow. The Meteor project is complete, I'll do this in three posts to make download times better. 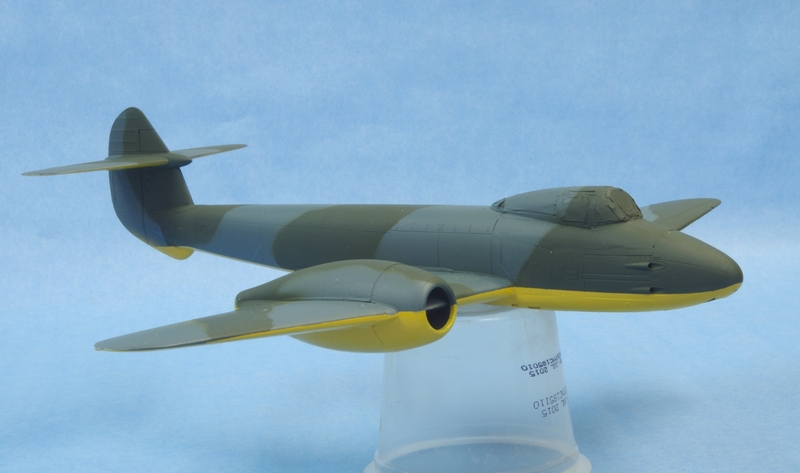 First the Meteor F.1 in prototype colors. 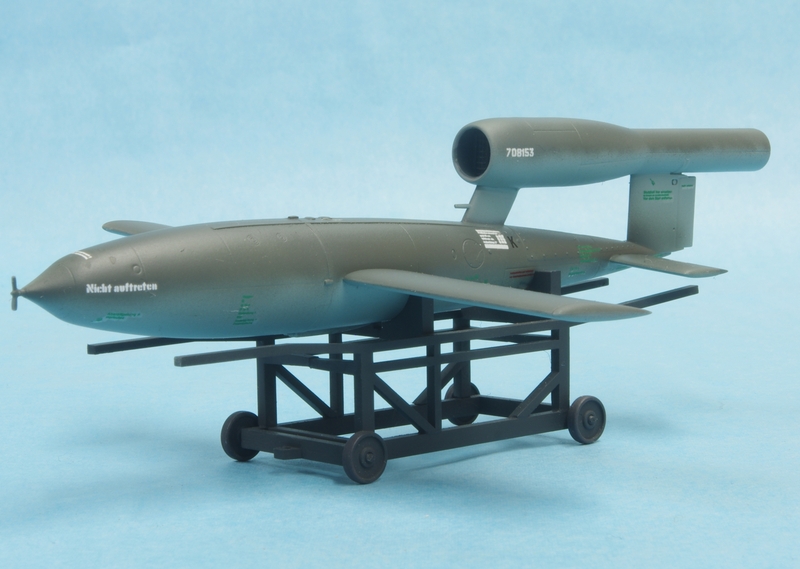 The F.1 was used to attack the V-1's and this is the Tamiya kit that was issued with the V-1. 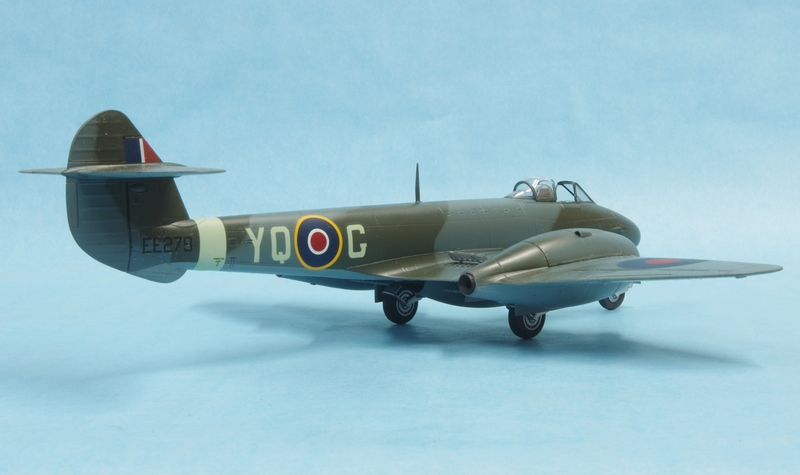 Next is the Derwent powered F.3, which differed also in having speed brakes, a different windscreen with sliding canopy, and short tail pipes. 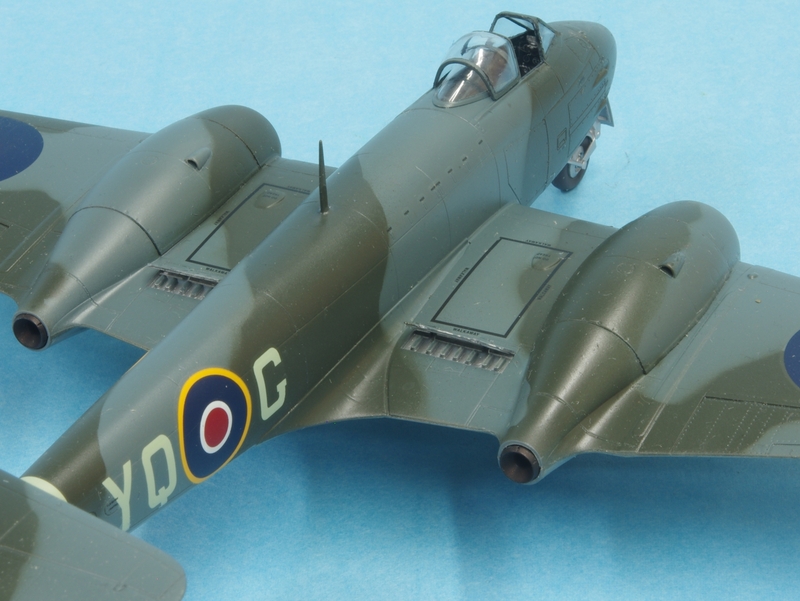 This model was built from the initial F.1 kit that was offered by Tamiya. 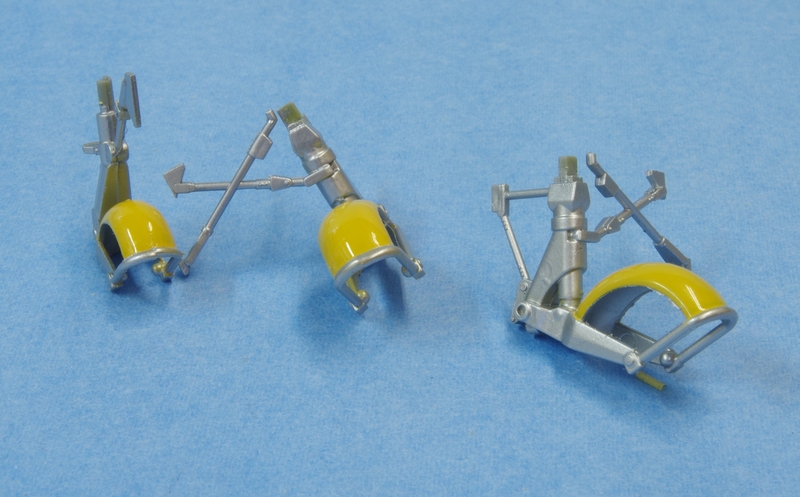 I was able to get the F.3 clear parts from Tamiya as well as the fuselage plug that it rests on. 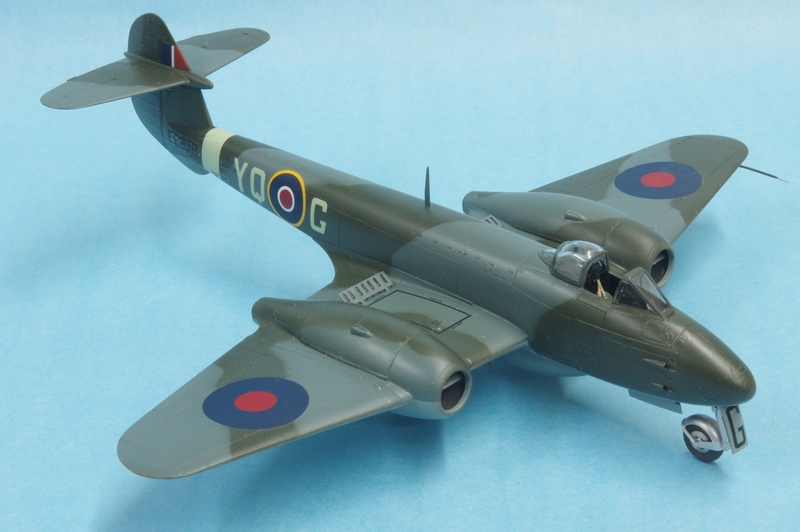 The serial is of a 616 Squadron airplane that was later painted white and went to the continent during WW II. The G code was included in the F.1 decals, so that was also easy. The serial was printed on a color laser printer. No display of the engine on this one, the Derwent I had a much different appearance from the Welland. 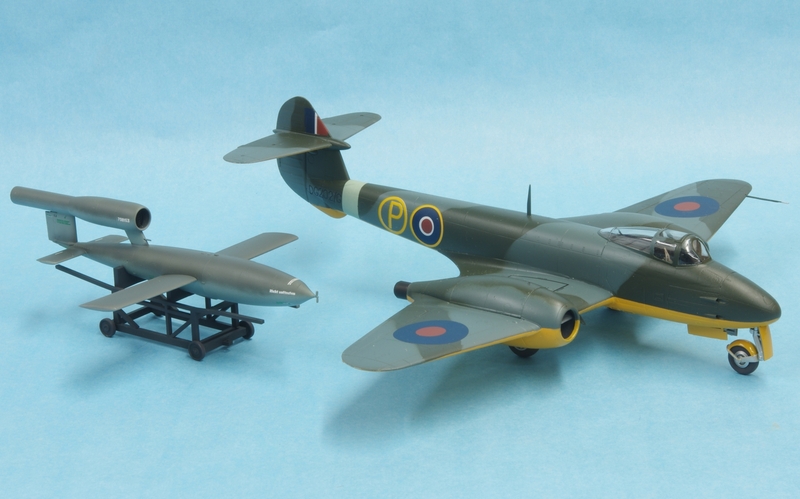 An F.3 can be built from this kit accurately if you do one of the first 15 built as they had Wellands, later ones got the more powerful Derwent I. 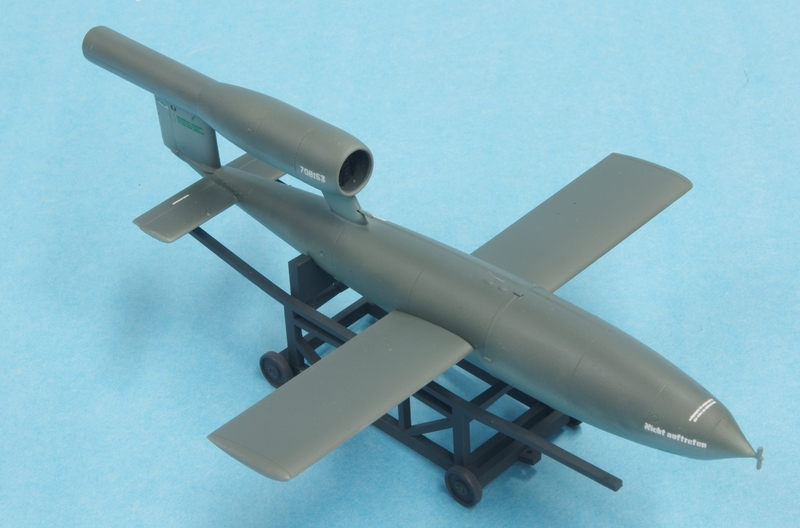 And last, the V-1 included in the second F.1 kit. A little seam work, then paint and decals, lots of decals. Don't add the wings and horizontal tails until you have cleaned up the seams on the fuselage and pulse jet, they get in the way. The trolley came with the kit. I needed this one in the collection, but there were some unpleasant thoughts in the process. Built by slave labor in terrible conditions, and launched to take an indiscriminate human toll, to me they are a reminder of the terrible acts one human group can inflict on another. Really, I did not know that. Thank you for enlightening me! I like the Meteor with the yellow underside the best, that's my personal favorite. As nice as your V1 came out, you are correct sir, it was a terrible instrument of war. Still, I admire your builds. Nice work on all 3 of your builds here, John. You are right about the trainer yellow paint - I have used it on a couple of recent builds and it does go on pretty easily when compared to gloss yellow. The British didn't give up in the idea or burying the engines between the spars for a very long time. Meteor, Canberra, Victor, Vulcan, Valiant, Comet (the jet one), Nimrod and I've probably missed a few. Those centrifugal jets don't get the press they deserve. P-80, F-84, F-86. I've probably forgot a few. Was there ever a commercial airliner with centrifugal turbines? 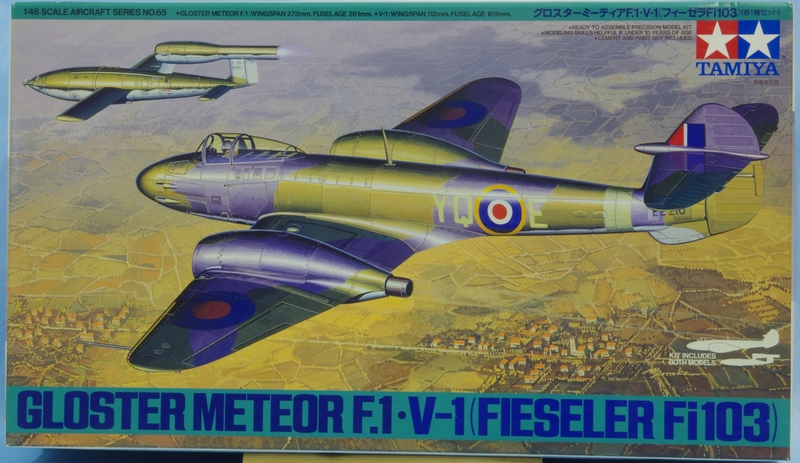 I once read that the Meteor was the first civil registered jet powered aircraft. I wish I could find the reference and context. Wow, those turned out super nice John. Both look great but I love the prototype F.1 with the yellow belly. I built the earlier kit years ago and yeah the nose weight is barely enough to hold her on all three feet, probably the only flaw in this gem of a kit. And maybe it's just me but as to early jets always thought the graceful Meteor was a much more attractive aircraft than the angular Me-262. Thanks, everyone, for the nice comments. I like the yellow lowers too, it's a nice change. Medium Sea Grey is OK also, though I probably just like all my "children". Bill, The Comet I had DeHavilland Ghost centrifugal flow engines, switching to axial flow Avons with the Comet II. 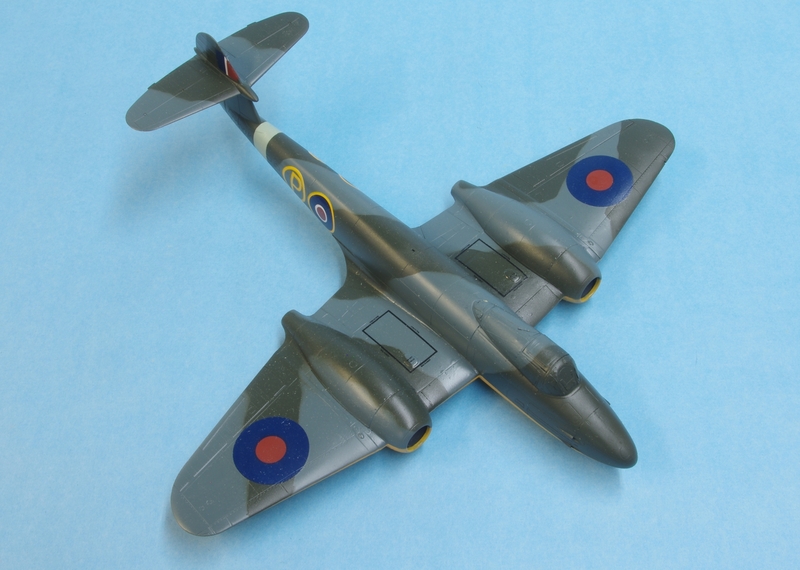 The Avro C-102 had four Derwents, but that like the Nene powered Jet Tudor was a one-off. 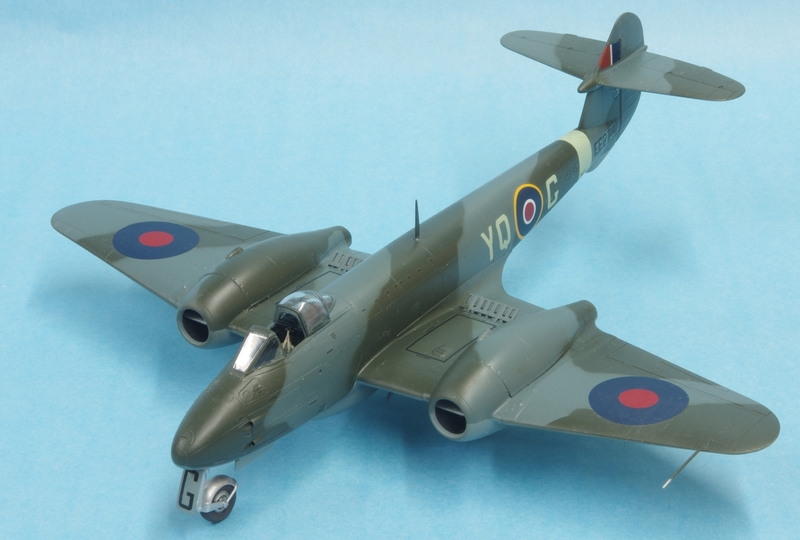 Gamera, what struck me was that if the Meteor had been thrown into combat at the same stage of development as the Me-262 it would have probably been in service first. The Meteors all had an excellent safety record, with 300 hour TBO's on the engines, while the 262 was only good for 10 hours. I think the main thing going for the 262 was that it was in a target rich environment. Aerodynamically I think the 262 was superior, but the rest was underdeveloped.